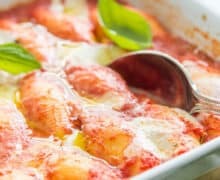 These three cheese Stuffed Shells are filled with creamy ricotta, mozzarella, and parmesan cheeses, then baked in a simple tomato basil sauce. It’s the perfect comfort meal that feeds a crowd! Though they will never be as popular as mac and cheese, stuffed shells are one of the best comfort foods ever, if you ask me. 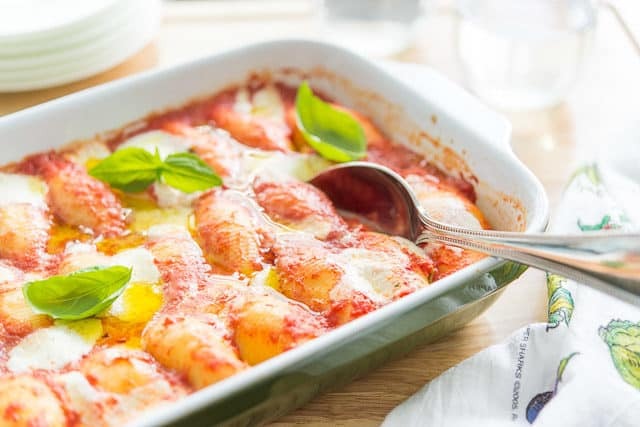 Creamy basil ricotta is enclosed in ridged shell pasta, and covered in tomato sauce, dots of fresh mozzarella cheese, and aged parmesan, and baked until bubbling. What’s especially nice about this recipe is it makes a big batch of food, and the leftovers keep well. I love my fresh “make it and it’s gone meals,” like a fresh Cobb Salad or Pan Seared Steak, but those types of dishes are typically best eaten right after they’re cooked, and they may not scale well. So I also like to make big batch leftover meals where you can make a large quantity that lasts for days. 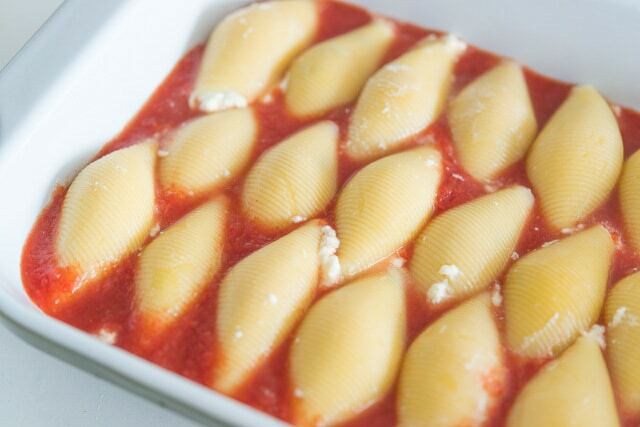 This Stuffed Shells recipe arguably tastes even better the next day, and microwaves beautifully! YAY leftovers. Before I go on with the recipe, I will say that the kind of ricotta you use here is SO important. In my experience, the mainstream ricottas that have stabilizer ingredients like Carageenan, Xanthan Gum, Guar Gum, and Locust Bean Gum typically taste terrible and don’t hold up well with cooking. The gums are there to keep the moisture from separating out on the shelf, but often when cooked in the oven, these stabilized ricottas separate and you get pools of liquid and grainy cheese. 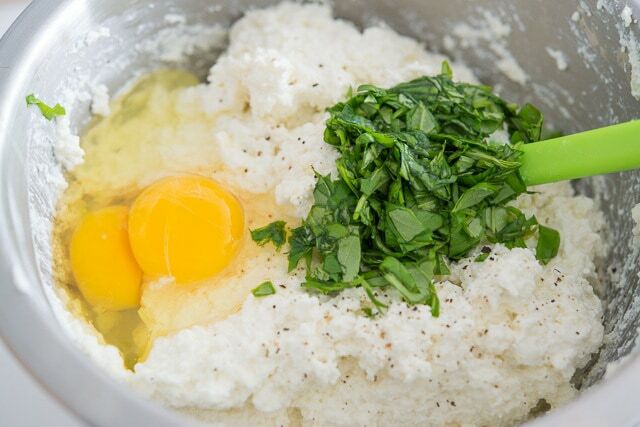 When purchasing ricotta, I look to see that the ingredients are simple: dairy, enzymes, salt. Sometimes I even make my own fresh ricotta cheese if I have extra time. Then, I love to drizzle with a really good extra virgin olive oil and fresh basil. Enjoy! Can Stuffed Shells be Frozen? Yes, but you want to bake it completely first. Let cool, then freeze for up to two months. Thaw before reheating. Can Stuffed Shells be Made Ahead? Yes, but you want to make sure you don’t add the tomato sauce, or else it will break down the pasta. Parcook and stuff all the shells, and refrigerate up to 1 day. Then add the tomato sauce before baking. 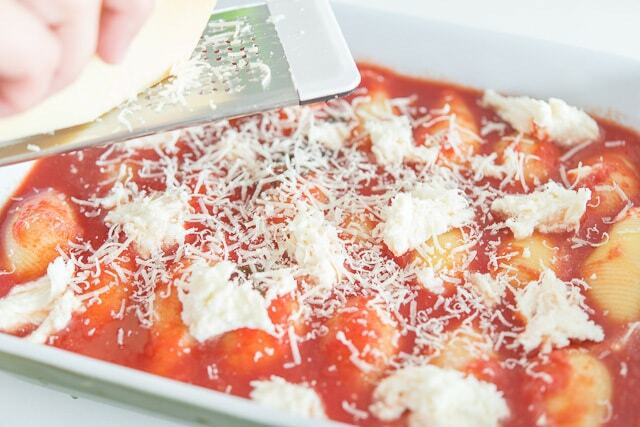 How Long Stuffed Shells last in the fridge: Leftovers will keep in the fridge for 3-4 days. What to Serve with Cheese Stuffed Shells: Because it’s a heavier dish, I like to serve it with something light, like Salad, Cauliflower Rice, or this brothy Sausage Kale Soup. 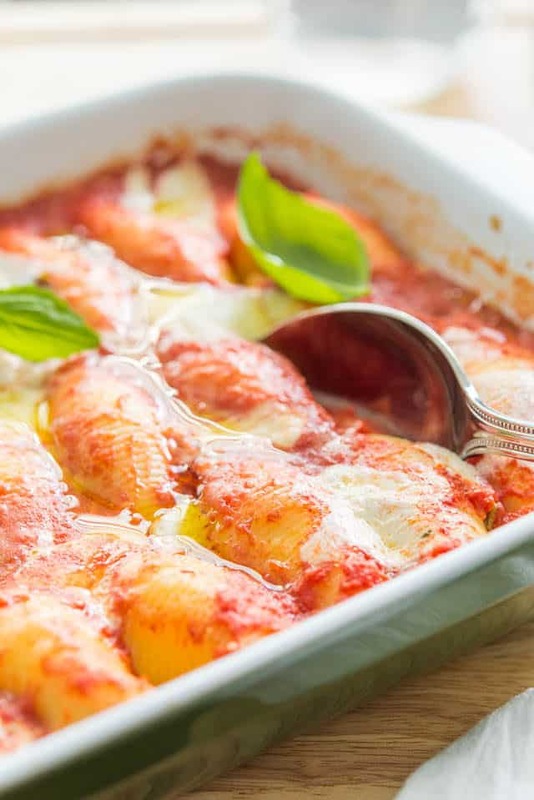 These classic stuffed shells are filled with three cheeses and baked in a tomato basil sauce. Perfect cozy meal for a chilly night! Bring a big pot of water to a boil, and add a few large pinches of salt. The water should taste salty, like the ocean. Add the jumbo shells and cook for 2 minutes less than the package states (I cooked mine for 10 minutes instead of 12). Drain and rinse with cool water. To make the filling, start by shredding about 1/2 of the mozzarella cheese (the rest will be used to scatter on top of the dish). Combine the mozzarella with the ricotta, parmesan, and basil, and stir well. Season this mixture to taste with salt and pepper, then add in the eggs. Beat this mixture for a minute or two until it has a light, whipped texture. Grab an 8×12 baking dish, as well as an 8×8. 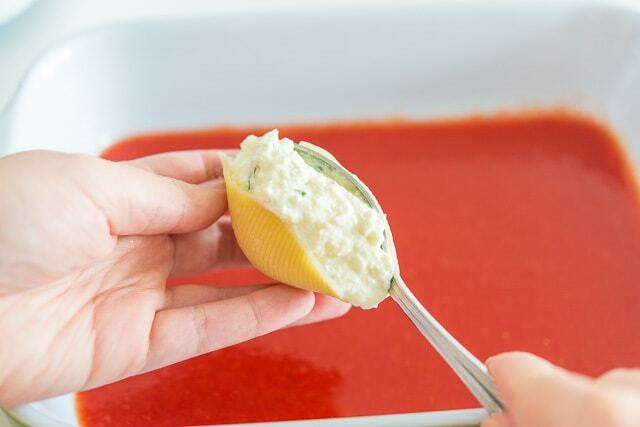 Add 1 cup of sauce to the bottom of each. Take your shells and place a spoonful of cheese filling into each shell, and place it into the pan, with the open side facing downward. Line the shells up snugly as you fill all of the shells, then top each pan with 1 more cup of sauce. Dot the top with torn hunks of mozzarella cheese, and if desired, add a little more grated parmesan on top. Cover each pan with aluminum foil and bake for 30-40 minutes, until the sauce is bubbling and the cheese has melted. 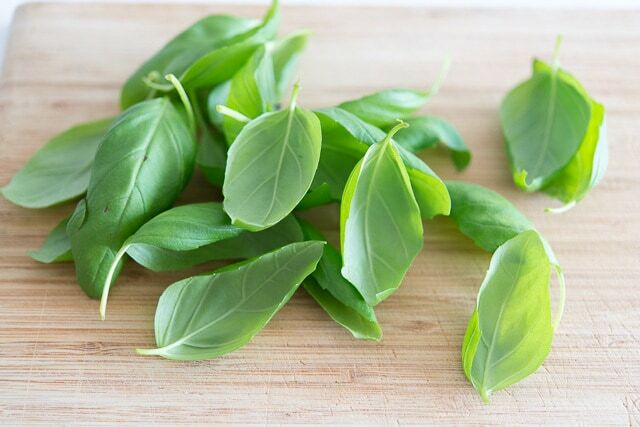 To serve, you may garnish with fresh basil or drizzle with extra virgin olive oil, if desired. Enjoy! *Please see the notes in the post above where I talk about purchasing ricotta for this recipe. **Sometimes I swap in a shredded 4-cheese mix for the parmesan when I don’t want to spend the time grating my own. then cut down the mozzarella by half. You want two cups of shredded cheese in the shells, plus a 1/2 lb of torn mozzarella chunks to dot the top. Post updated in June 2018 with more photos and writing. Originally published in June 2014. Gie me all the cheese! What a great comfort food meal! Looks very good, very similar to how my grandmother taught me. One of the few recipes for this classic dish (my Italian family and I have made for years) that correctly shows the shells placed SEAM SIDE DOWN. If you place it seam side up, more than likely much of the cheese will run out of the shells and all over your baking dish (I know because I made the error once or twice while in a rush). A word to the wise – heed this advice!